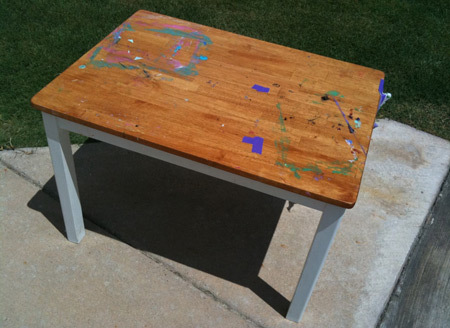 Last week while out and about, Chuck sent a picture of a small kids’ table one of his neighbors was throwing away. It looked a little rough for wear but still in decent shape. He hauled it back to his shop where it awaited transport to my shop. He then went back and got the two rather beat-up chairs that went with it. The table top had a butcher-block style hardwood top that was in desperate need of refinishing, and the legs on it had to go. 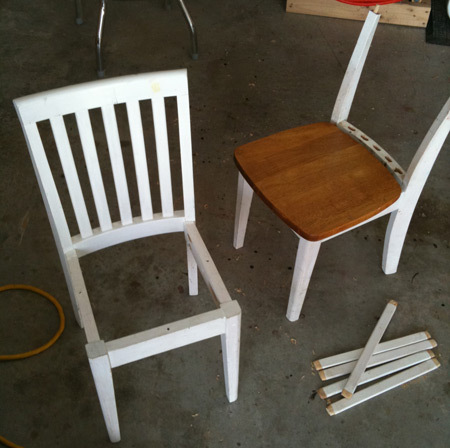 The chairs could either be cannibalized to make one good one as one was missing its seat and the other had back issues — or, with a little time and effort, I could salvage both and have the whole set. I opted for both. The first step was to fix the most troublesome area, which was the chair with back problems. Because I didn’t want to make a whole new top piece and I was going to repaint those parts of the chairs anyway, I decided to chisel out the chip so it was flat on two sides and make a wedge to fit in the gap. Once cut, fitted, filled, and painted, no one will ever be able to tell anyway. Next the chair with the seat bottom missing required a new seat. 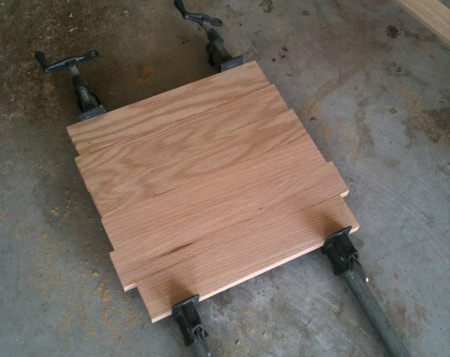 So with a little cut-up 3″ oak trim that had a run or two on the jointer, I glued up a few pieces that would make up the seat and set it in clamps. 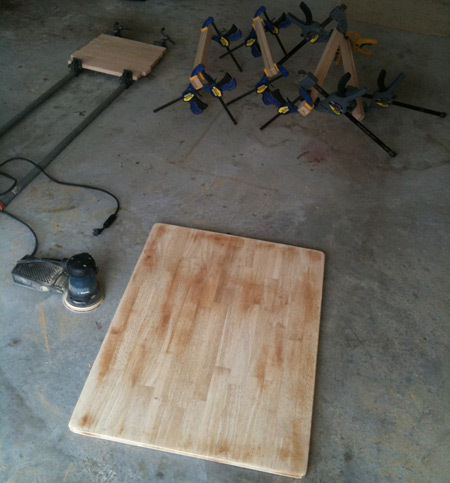 From that point I spent a little time cutting and gluing up a few legs and sanding down the top with the random orbit sander, and it was time to let the glue set and call it a day. Next up comes the fun part — making all of this mess go back together and look like it had never been apart in the first place. A worthwile pursuit. In todays throw away culture it is good to see what some might call junk, be given a second life. Adds some meaning to the saying, “One mans trash is another mans treasure”. You may enjoy – myrepurposedlife over on blogspot. That blogger does a lot of of this type of thing, along with a bunch of other clever repurposing of things others no longer want. The chair presents (presented?) a perfect opportunity to experiment with hide glue! 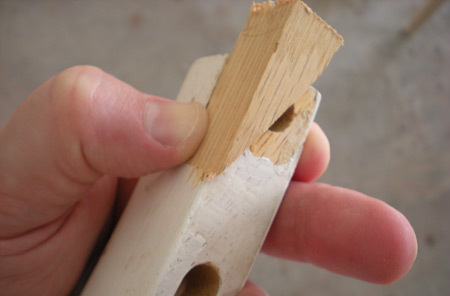 In joints, hide glue becomes rock hard when dry so there’s no play that makes the chair wiggly even if the glue lets go. I want to warn you that sand off an existing finish (table top) is a particularly ineffective way to get the old finish out. It’s almost impossible to get the finish out evenly and that will show up if you try to stain it. While your top is solid, had it been veneer, there is also a chance of sanding through veneers. Your better bet is to use a chemical stripper. It is not too late to do this and I’d suggest going through that exercise before continuing further. There’s a chance all will work out fine. But there’s a greater chance that you are going to get a splotchy stain job or have potential adhesion problems with your top finish. i can’t believe someone would throw that out. even as is it would work perfectly for a workshop of any kind. good work on the reclaim!